The Victorian and Tasmanian PHN Alliance (VTPHNA) has been commissioned by the Victorian Department of Health and Human Services (DHHS) to support an integrated approach to the implementation of the Optimal Care Pathways (OCPs) for cancer into primary health. The VTPHNA has entered into agreements with all six Victorian PHNs to implement the OCPs in their catchment. Statewide project management and coordination is provided by the VTPHNA to ensure a consistent approach, enable collaboration and information sharing, and avoid duplication of work where possible. PHN roles in relation to General Practice engagement, health pathways development, and integration of care for catchments and communities. Each individual PHN is responsible for planning and implementing the project activities within their region, taking into account the specific needs and demographics of their population identified through their local Health Needs Assessment. What are Optimal Care Pathways? Optimal Care Pathways are national guides that describe the best possible cancer care for patients with specific types of cancer. The pathways describe the key stages in a patient’s cancer journey, from diagnosis to survivorship or end-of-life care, and the expected optimal care at each stage to ensure all people diagnosed with cancer get the best care, regardless of where they live or have cancer treatment. Currently there are fifteen OCPs for different cancers and more under development. Developed by clinical experts in collaboration with consumers, the Optimal Care Pathways have been endorsed by the National Cancer Expert Reference Group, Cancer Australia, Cancer Council Australia, and the Australian Health Ministers Advisory Council (AHMAC). The OCPs map the patient journey, aiming to improve patient outcomes by facilitating an understanding of the whole cancer pathway and its distinct components to promote quality cancer care and patient experiences. The OCP resources identify critical points along the care pathway and the recommended care and timeframes at each point. OCPs provide clinicians and health administrators with an agreed consistent nationwide approach to care that is based on current best practice including clinical guidelines, consensus statements, standards and research. Localised HealthPathways for lung, colorectal, prostate and oesophagogastric cancers are available across the six Victorian PHNs. Visit your local HealthPathways website for more information. The eight geographically-based Integrated Cancer Services (ICS) across Victoria are also working on projects to implement the OCPs into acute care settings. The ICS work across the same main activity areas but in the acute health setting: customisation and further development to align health practice with the OCPs, education and training, local network facilitation and measurement. As part of this work, ICS are primarily responsible for monitoring and assessing the patient experience of their cancer care. The PHNs and ICS work together at the intersections of primary and acute care. The DHHS has commissioned the VTPHNA to support the comprehensive and consistent adoption of specific cancer OCPs into primary care. There have been three tranches of project activity to date, focusing on different OCPs. The first tranche focused on lung and colorectal OCPs over 2016 and 2017. The second tranche on prostate and oesophagogastric cancer OCPs from late 2017 through 2018; and from November 2018 the focus will shift to melanoma, pancreatic and head and neck cancer OCPs. In 2019, a project to fast-track the development of care and referral pathways consistent with all the remaining OCPs will commence. This provides a significant opportunity to embed the OCP framework within primary care in a much shorter timeframe than currently possible through the existing implementation approach. For more information about Tranche 4 please contact the statewide coordinator, Roxanne Adams on (03) 8578 0505.
identify areas for service improvement through data collection and monitoring. Implementing the OCPs into primary care has a focus on working with GPs and other general practice staff on prevention and screening, diagnosis and investigations, referral to cancer specialists and acute care, primary care treatment and support for cancer patients post-acute care, and the acute-primary care interface. A fundamental component of the project is the partnership approach between ICS and PHNs to identify locally relevant issues or gaps in service and to work together to develop solutions and interventions for local catchments. The PHN and ICS catchment boundaries mean that one PHN may work with multiple ICSs, and vice versa. There are four main activity areas for each PHN: customisation and development of care and referral pathways to align with the OCPs, education and training, local network facilitation and data capture/measurement. In addition, each PHN works with their local ICS and other key stakeholders to identify areas of focus based on an identified problem statement, issue or gap in service. For each area of focus a small specific intervention or project is developed. 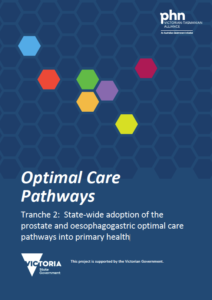 The implementation of the optimal care pathways into primary health project is supported by the Victorian Government.